So, we would be lying if we said we aren't just a little bit excited to welcome The Philanthropist to Trafalgar Studios next month... Christopher Hampton's 'bourgeois comedy' takes place in an English university town with the surprising backdrop of the Prime Minister's assassination, along with his entire cabinet. And in true form, this classic play's long awaited return to the West End also brings with it some pretty clever and pant-wettingly funny actors. 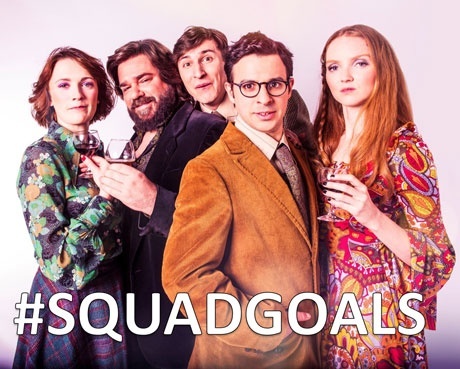 Matt Berry, Simon Bird, Lily Cole, Charlotte Ritchie and Tom Rosenthal are the famous faces (though 'national treasures' may be more appropriate) that will be forming what we can only refer to as the capital's super-cast. And what's more, the whole thing will be under the expert supervision of none other than theatrical legend and one-man powerhouse Mr. Simon Callow. With the help of several award-winning TV shows and some prolific co-stars, we want to show you just how inter-connected the web of association really is for this new cast. 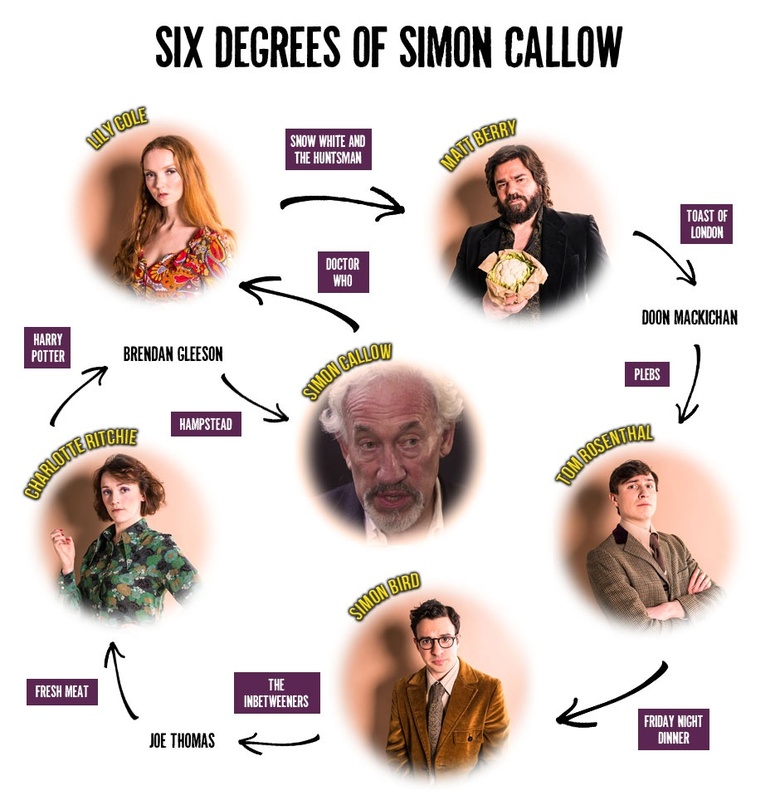 So hold onto your seats for the first public unveiling of the latest academic theory taking the world by storm: Six Degrees of Simon Callow. Discovered outside a burger shop at age 14, Lily Cole was the youngest model to cover British Vogue. If that wasn't enough for you, Cole also graduated with a first from Cambridge, is a tech entrepreneur and still finds time to be an actress. You may have seen her as a siren in Doctor Who; in an array of independent short films; or in big blockbuster films such as St. Trinians with Tamsin Egerton and Paloma Faith, and The Imaginarium of Doctor Parnassus alongside Heath Ledger. Another multi-talented performer, Matt Berry is an actor, writer and musician who has worked with the likes of Noel Fielding and Richard Ayoade. If you dont know him by face, you may know him by voice as hes voiced adverts for Volvic, The Natural Confectionery Company, Absolute Radio and Moneysupermarket.com. Best loved for his portrayal of Douglas Reynholm in The IT Crowd, Berry recently created and starred in Toast of London whose cast includes Doon Mackichan. Degree of separation: The wonderful Doon Mackichan can also be seen in ancient comedy Plebs. But who else starred in this? He starred in all three series and the subsequent movies alongside the 'Simon' to his 'Will': long-time collaborator Joe Thomas. Most recently Charlotte Ritchie has been seen in Call The Midwife and as university student Oregon in Fresh Meat with Zawe Ashton, another Trafalgar Studios alumnus (The Maids, 2016). However, did you know that Charlotte had one of her first gigs as an unpaid extra in the Defence Against the Dark Arts classroom on the set of Harry Potter and the Goblet of Fire? And her teacher in this scene was the inimitable Alastor 'Mad-Eye' Moody, played by titan of screen Brendan Gleeson. You guessed it! A veteran of British theatre, Simon Callow, CBE has starred in many West End plays including Being Shakespeare, which also had its debut at the one-and-only Trafalgar Studios. As well as being a keen writer of biographies, Callow is no stranger to film and television. Having earned a BAFTA nomination for Four Weddings and a Funeral, hes also had the greater honour of guest-starring in the British classic series Doctor Who. You can crack open the wine now, because we're finally back where we started to begin the six degrees all over again. Fear not though, as we've mapped out all the surely-not-coincidental connections and trivia in full below, to help your team dominate at your next pub quiz! Can you find any more connections between The Philanthropist cast? 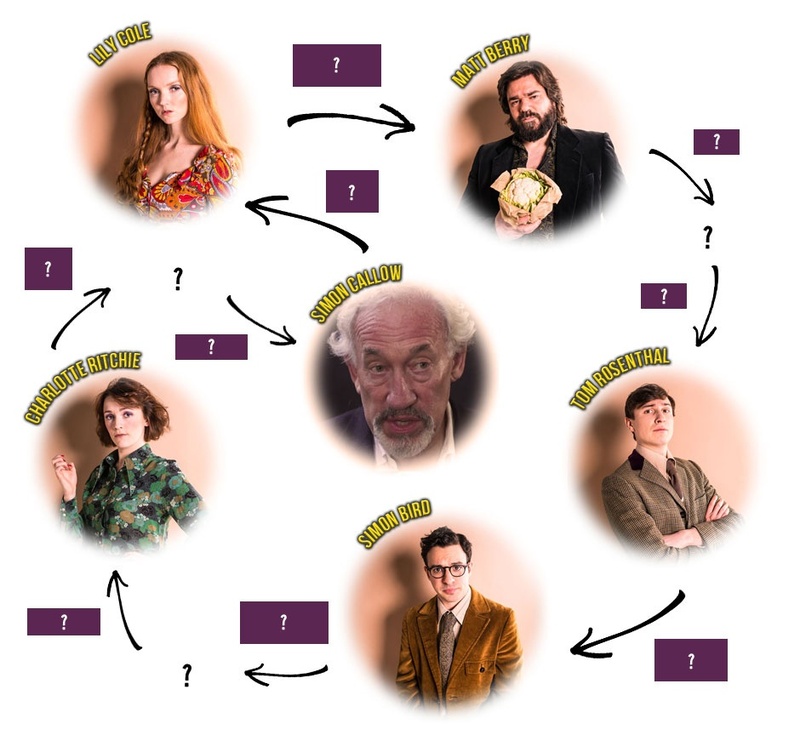 Only a couple of degrees away from Simon Callow yourself, or any other of the show's stars?